Published June 16, 2010 By Anna T. This post may contain affiliate links. Regardless, I only recommend sites I've researched and/or used and trust. The Content Authority is very, very similar to Textbroker. And since Textbroker is so popular and the sites are similar, I decided to create a review of The Content Authority for writers who may be interested in signing up. If you would love to get paid to write from home and you don't mind ghostwriting, this is a site you might want to check out. Keep in mind it's a content mill, so the rates are not going to be anywhere near as high as they might be if you were doing professional freelance writing and setting your own rates. Who can apply at The Content Authority? This company is open to writers worldwide. However, you do need to have a strong grasp of the English language, good internet research skills, and the ability to write formal articles at a high school level or better. How much does The Content Authority pay? They do not list specific pay rates on their website. Instead, it basically just says that it varies depending on different factors, including the tier level of the writer, number of words, and article type. It's safe to say it's going to be on the low end. The Content Authority and sites like it generally do not pay much more than one cent per word. Sometimes less than that, sometimes maybe slightly more. How and when does The Content Authority pay? They pay with Paypal and payments are processed every week. You do need to have a minimum of $25 in your account to get paid. If you do not, your pay will roll over to the next week, and on and on until you have enough to get a payment. The Content Authority processes payments on Mondays. Please keep in mind that this writing opportunity (and quite frankly most writing opportunities) will not suffice for full-time work at home income. Any writing site you're accepted to write for generally does not guarantee you a set amount of work. And for this reason, you cannot realistically depend on it. Just look at it as extra money — something to take advantage of here and there when you need a little extra and they have work available. 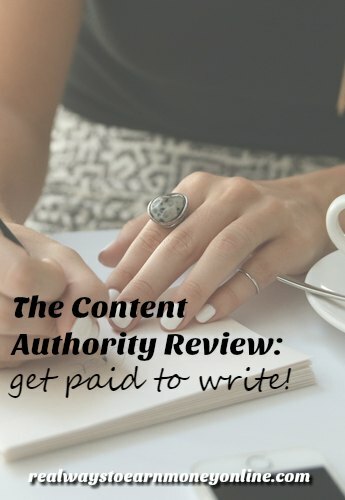 How do you apply to write for The Content Authority? To get started, you must first write a sample article for them which you will not be paid for. The Content Authority claims they will not use this article for any reason apart from just judging your writing quality. Everyone starts off at Tier 1, the lowest writing level paying the least per word. After submitting five articles, your work will be reviewed and you may be moved up to Tier 2 if they feel your quality is good enough. Consistently submitting good quality, error-free work with The Content Authority increases your chances of moving up in tier level and thus making more money for your articles. What is your employee status at The Content Authority? You work for The Content Authority on a freelance basis, as an independent contractor. This means taxes are your responsibility. What if your articles are rejected? If the client you are writing for within The Content Authority is not satisfied with your work, they have the right to reject it if you cannot correct it or cannot submit it within the allotted time frame for that article. The publisher has 72 hours after you've completed your work to either approve it or ask for a revision. If they fail to do either, article auto-acceptance and payment will occur. You will receive warning notices by the company for plagiarism and multiple rejections. Account deactivation is likely after three warnings. What if the client really likes your work? If a client particularly likes your work, he or she may send you a direct order. You can choose your own rate of pay for these orders. What do people say about The Content Authority? I checked Glassdoor for a review of The Content Authority from someone who writes for them, but I wasn't able to find anything. But some scouring around the internet uncovered that some people who write for The Content Authority feel that they have super high standards that don't quite match the low pay rates. For example, account deletion is imminent after just three client rejections. There are others who really like it and use them regularly. There are also some reviews on Indeed.com. There were complaints about the low rate of pay and the fact there is not a lot of work available for the tier 4 writers. Most of the work is tier 3. But, it's flexible and a way to earn supplemental income if you need it. That said, I think having an account here may not be a bad thing if you regularly use Textbroker and other sites similar to Textbroker for occasional freelance writing work. If work dries up at one site you use, you could always check at The Content Authority to see if they have anything you could grab. How do you sign up at The Content Authority as a writer? You can go here to apply. Keep in mind they are not always accepting writers (the application page has stated they are not currently reviewing applications for quite some time now). If they aren't hiring, you might want to check out this list of 100 sites for freelance writers for some other options. You can also check my work at home job leads page to see what companies are hiring right now. I usually have some current freelance writing positions listed there. I hope that this general review of The Content Authority has given you some insight on the company. Good luck! Just got accepted to the program. So far seems like a good site to add the my list. Congrats! I know a lot of people do like writing for them. Sorry to hear that! It does say though that they will keep applications on file for when they are hiring again, so maybe they will contact you at a later date.